afrol News - Tanzania, Zambia "too corrupt to trade ivory"
Tanzania, Zambia "too corrupt to trade ivory"
afrol News, 12 March - British and US environmentalists have angered Tanzanians and Zambians with a new report strongly advising against legalising the sale of local ivory stocks, saying "official corruption" would lead to further illegal ivory trade. The attack comes shortly before the annual meeting of the Convention on International Trade in Endangered Species (CITES), where the ivory trade has been a yearly discussion since the trade was banned in 1989 to protect elephants. CITES since then twice has allowed a limited sale of ivory stockpiles for African countries managing their elephant populations well. At the upcoming CITES meeting in Doha in Qatar, Tanzania and Zambia have announced a similar request. The two African countries will ask for a one-time permission for a legal sale of their growing ivory stocks. The tusks, governments hold, stem from animals that had died naturally or were culled to thin herds as part of recognised management schemes. Also a yearly tradition, environmentalists issue strong protests against any attempt to weaken the 1989 ivory trade ban, presenting "scientific" evidence that a one-time sale would lead to increased poaching. First to react was scientist and environmentalist Sam Wasser, Director at the Washington Centre for Conservation Biology. Mr Wasser has used DNA to trace the origin of the - still large quantities of - ivory reaching illegal markets, mostly in Asia. He concludes tusks come mostly from Zambia and Tanzania, criticising those governments for "denying the extent of their illegal activity in their country." Much tougher was a report issued yesterday by the so-called "Environmental Investigation Agency" (EIA) based in London and Washington, presented in the world press as a scientific investigation. In reality an environmentalist group, EIA strongly attacks the governments of Zambia and Tanzania. "EIA undercover investigators recently visited Tanzania and Zambia and returned with harrowing first-hand evidence documenting a flourishing trade in illegal ivory in both countries, often exacerbated by official corruption," the group presented its study. Especially Tanzania - a country generating much revenues from wildlife tourism - is accused of corrupt standards and questionable motives for seeking a one-time ivory sale. "Tanzania's elephant population declined by more than 30,000 elephants between 2006 and 2009, primarily from poaching to supply black-market ivory to Asia," EIA claims. "Rampant poaching is concentrated around the Selous Game Reserve," the group holds. "In 2009 several major seizures totalling some 12 tonnes of ivory occurred in Asia. DNA studies from earlier seizures of Tanzanian ivory in Asia has shown that much of the ivory originated from the Selous," EIA claims to know. "In February 2010, EIA investigators posing as buyers easily found ivory for sale in the markets of Dar es Salaam, identified hotspots for illegal ivory trading in southern Selous, and gathered data on recent poaching incidents," the group claims. Also in Zambia, EIA members claim to have found that "ivory is easily obtainable in large quantities." The group "reveals" that the country has "a thriving illegal domestic market and is at the centre of the international ivory trade, hosting some of the world's most sophisticated traders and networks - which in some instances use government military vehicles to transport illegal ivory." Unnecessary to say, EIA in its "report" concludes "it would be a tragedy for elephants" to allow Zambia and Tanzania to sell a quantity of ivory legally. But not all environmentalists are equally fundamentalist in their approach. WWF biologists have, on general terms, favoured limited legal one-time sales of ivory, which in theory also could include Zambian and Tanzanian sales, if it is "entirely controlled." So far, however, WWF is not convinced Tanzanian and Zambian tusks are "entirely controlled," and have indicated they will vote against such a sale at the CITES meeting, for now. In Tanzania and Zambia, the harsh accusations by some environmentalists have caused anger. Both countries claim to have documented well that their elephant populations are growing, not declining as EIA claims. 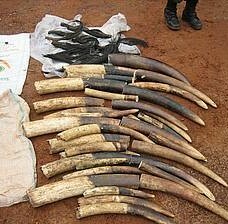 Further, governments had earmarked revenues from the ivory sales - expected to reach US$ 46 million in Tanzania alone - "for protection of natural resources, an undertaking which needs a lot of money," according to Tanzanian Natural Resources Minister Shamsa Mwangunga.